There was no luck for the two local teams still remaining in the FAI Junior Cup as both Willow Park and Ballinasloe Town exited in the sixth round. 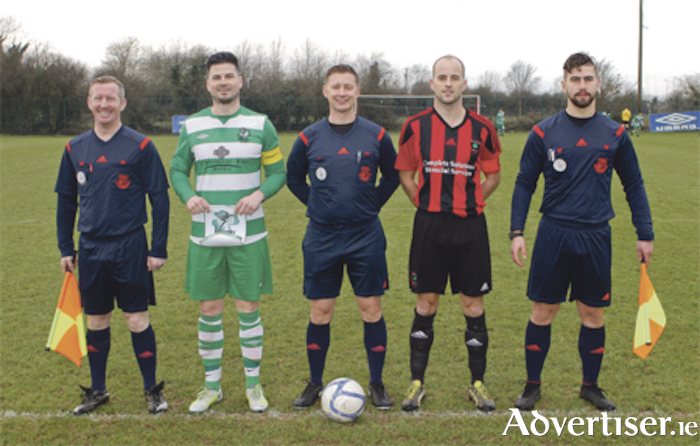 In a game of three penalty kicks and two red cards, Willow were beaten by Killarney Celtic after extra time, while Ballinasloe suffered a four nil drubbing at the hands of St Michael’s. Declan Holohan’s Willow outfit were first into action last Saturday afternoon (January 13 ) as they played host to last season’s beaten semi-finalists from Kerry. Celtic shook off the long trip from the Kingdom by taking an early lead, when a free kick on the left from Matt Keane went all the way to the net past a distracted Michael Fogarty in the home goal. Willow offered little in response for the remainder of the half and looked set to make a low key exit from the competition. The hosts rallied, however, on the resumption of play and were on level terms within three minutes of the second half getting underway. Benny Magennis was fouled and Robbie Shine stepped up to take the resulting penalty kick. The defender has a fine record when it comes to taking spot kicks and made no mistake with a cool finish. Killarney had a period of dominance around the hour mark, but just when Willow looked to have survived the storm a controversial decision rocked home fans. Goalkeeper Fogarty was adjudged to have fouled Wayne Sparling on 71 minutes as he attempted to steer the ball home and was sent off. Jack Quinn eventually took over between the posts and his first task was to face up to Jamie Spillane’s penalty kick. Amazingly, the stand in keeper came up trumps as he dived to his left to smother the ball at the post. Celtic too ended the game with 10 men following a second booking for Brendan Falvey, and extra-time was then needed to decide which team advanced to the last 16. Willow had a number of chances to win the tie in the extra-time period, but luck favoured Killarney on this occasion when they successfully put away the third penalty of the tie. Midway through the first period, Sparling was fouled inside the box and John McDonagh took responsibility this time. Quinn was unable to repeat his earlier heroics as the kick flew past him to the net. Substitute Hafeez Sholola then somehow headed against the upright from close range, while two headed efforts from Stephen Relihan were off target as Willow made their exit. The outcome in the Curragh Grounds a day later was much more clear-cut, as Ballinasloe also failed to make home advantage count. The final scoreline might suggest an easy win for St Michael’s from Tipperary, but Henry Loughnane’s men were out of luck when in front of the target, and a number of penalty calls also went unheeded. The hosts trailed by just a single goal at the break, but a strong second half performance saw the Saints advance.